Magnum Opus: A Tribute to Ntarikon is a dirge; a long melancholic walk down memory lane by a poet who bemoans the demise of his native land. This long poem documents a momentous event in the political history of the Republic of Cameroon—the launch of a bona fide opposition political party—the Social Democratic Front (SDF) on 26 May 1990 at Ntarikon Park in Bamenda. Throughout our sojourn here on planet earth, from the cradle to the grave, we internalize information culled from our lived experiences, from the experiences of others, and try in some way to make sense of it all. When we are unable to make sense of the events that have scarified our lives, we tend to exteriorize the information in writing or through speech acts and non-verbal language. By so doing, we are afforded a different perspective, thus allowing us to think more clearly about the things that have transpired in our lives. Poetry is one of the ways in which I externalize my thoughts. Versification provides me with an outlet for pent-up emotions. Poetry allows me to communicate issues that I might not be able otherwise to openly discuss. It affords me the opportunity to self-evaluate, ponder the relationship with my target readership; conceptualize the nexus between my life and the world around me. Magnum Opus: A Tribute to Ntarikon is in many ways a cathartic poem. It is important for readers to know that this poet is a grafi from the grassfields of Cameroon, the capital of which is Bamenda, the Cameroonian equivalent of Aleppo in Syria. On account of its fierce opposition to the dysfunctional government of lame-duck President Paul Biya, Bamenda has become the bête noire of the francophone majority government in the country. In fact, the people of Bamenda have borne the brunt of Paul Biya’s wrath for thirty-five years (1982-2017). Another historical piece of information that this poet owes readers is the fact that he worked as Senior Translator at the Presidency of the Republic of Cameroon in Yaounde from 1991-1996. During this psychologically tumultuous stint at Etoudi, seat of the presidency in Cameroon, the poet bottled up so much unsettling information that he became ill at ease. That is why this book is immensely therapeutic. It is important for readers to bear in mind that each verse in the poem is the voice of a dissent, the expression of a mind that yearns to bring sanity to an insane world. There’s no gainsaying the fact that recalling our yesterday gives birth to our tomorrow. 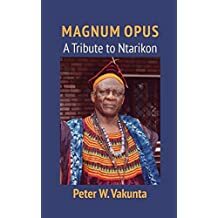 “Magnus Opus: A Tribute to Ntarikon” is a scathing indictment of the political status quo in the Republic of Cameroon where the ruling party, the Cameroon People’s Democratic Movement (CPDM), rides roughshod over the populace. In this long poem, Vakunta cries out poignantly against dystopia and the deplorable moments lived by members of the Social Democratic Front (SDF) at Ntarikon Park on May 26, 1990. One cannot read this poem without feeling the despair and helplessness experienced by members of this political party as they were maimed, killed and reminded that the future holds no good for them. The prosody and semantics of the poem amplify the ontological angst experienced by Cameroonians on a daily basis.